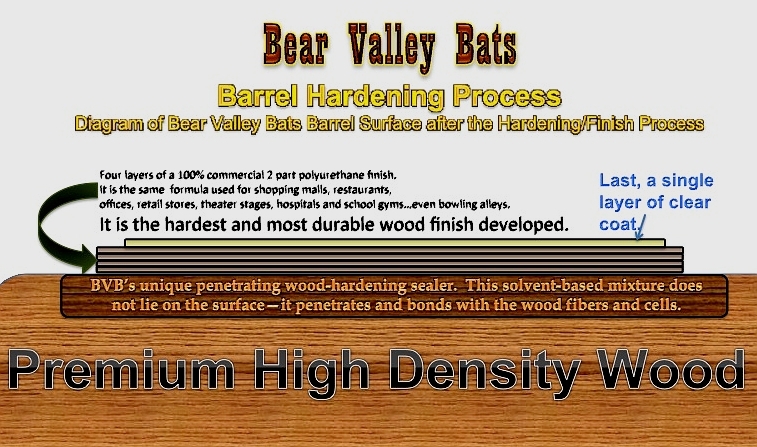 Bear Valley Bats - TRUE HICKORY BATS NOW AVAILABLE! ﻿*Pignut Hickory﻿*Shellbark Hickory& *Shagbark Hickory Premium White Oak Bats Now Available Too! Above, a genuine BVB Pignut Hickory bat --- all Bear Valley Bats are custom made by hand. THE Best Quality Wood Baseball Bats-Hand Made, Custom Made, Highest Performance and Durability A client writes: "We are very pleased with the bats. Tyler uses these bats exclusively for batting practice sessions and a lot of games so each of these bats has likely hit 2000 - 5000 balls. The rubber machine balls are used for 75% of the work for each bat. BTW- our observation is that the current BVB Heartwood bat that Tyler is using hits the ball further and more consistently than any BBCOR bat that we have tried. We have field tested 4 BBCOR bats along side each other and the BVB bat. The BBCOR bats produce widely varying results but none yet have equaled the results of the BVB. I don't know how to explain it but that is what we are seeing in our field tests. Mike"---February, 2012﻿See comments from other clients here Brazilian Cherry Is Here!Unmistakable for its beautiful deep red and gold tones, this wood is reserved for the finest furniture and flooring. BVB now makes the finest mid-range heavy training bats and trophy bats from genuine Brazilian Cherry. 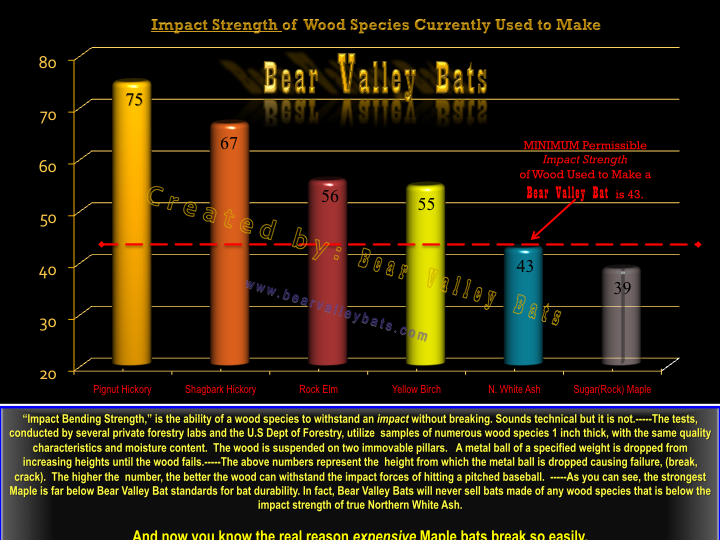 For Price Information Click Here Below is our Strength to Weight Ratio Chart to help you decide on the best wood species for your bats. Place your cursor over the chart and click the "+" in the low right hand corner toENLARGE. For more information on the best wood for your bats please click here : Determining the Best Wood for Your Bats(Above, BVB Model 75's in our Canadian Yellow Birch)Every bat we make is genuine pro quality and nothing less. "Inspected by More Umpires Than Any Other Bat Manufacturer"
Just check out with PayPal to receive this offer! TRUE HICKORY BATS NOW AVAILABLE! Premium White Oak Bats Now Available Too! Above, a genuine BVB Pignut Hickory bat --- all Bear Valley Bats are custom made by hand. "We are very pleased with the bats. Tyler uses these bats exclusively for batting practice sessions and a lot of games so each of these bats has likely hit 2000 - 5000 balls. The rubber machine balls are used for 75% of the work for each bat. BTW- our observation is that the current BVB Heartwood bat that Tyler is using hits the ball further and more consistently than any BBCOR bat that we have tried. We have field tested 4 BBCOR bats along side each other and the BVB bat. The BBCOR bats produce widely varying results but none yet have equaled the results of the BVB. I don't know how to explain it but that is what we are seeing in our field tests. Unmistakable for its beautiful deep red and gold tones, this wood is reserved for the finest furniture and flooring. 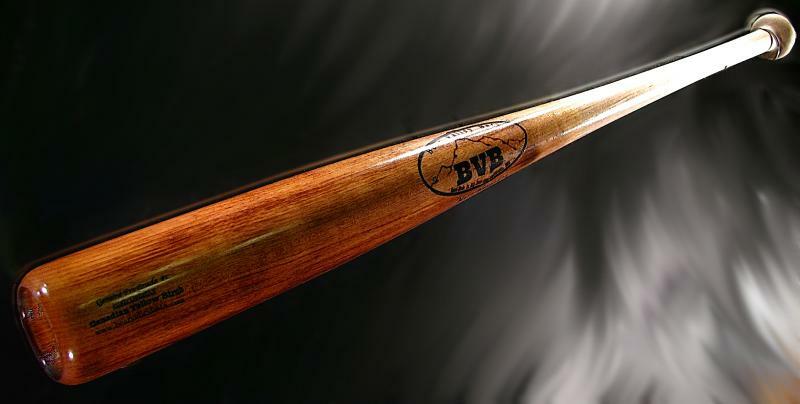 BVB now makes the finest mid-range heavy training bats and trophy bats from genuine Brazilian Cherry. Every bat we make is genuine pro quality and nothing less. Above, a 911 memorial bat made of true hickory and used by a client in his firefighter's league. Although we take pride in the appearance of our bats, our primary job is to make a custom bat, with the finest wood and best designs, that performs at the very highest level. We often contact our clients, espcially new clients, about their evaluation of the performance of their BVB bats. THE most important information we get is from our clients. That critical client feedback, coupled with our own testing, enables BVB to make the very best performing MLB-compliant baseball bats. As a result, we have the most loyal clients, both professional and amatuer, on every continent where baseball is played! "Just checking in with a progress report. Isaak's bat was received at Christmas 2012. He loved the way it looked. It is still going strong and he hit over .400 for the season with a ton of extra base hits. He has gained so much confidence with it, it is by far the best bat he has ever had. Thank you for that. He is thinking of getting one or maybe a couple more with the same exact specs just to have as backup in case it finally breaks. Its not looking like it will any time soon though, still has the same pop as when it was brand new. Great job!! (Above), before we even select the wood for your bats, we send you a diagram of your order. You can make as many changes as you want, without extra charge. (For new customers, we often spend as much time designing the bat as we do making it.) Our goal is to provide the very best quality and performance, in a design exactly as our customers request. please take some time to go through the website and learn what makes a great baseball bat. Whether you buy from BVB or another company, please use the information provided here to make an informed decision on the kind of bat you purchase. Above, photograph of modified BVB Model 75's. With Bear Valley Bats, EVERY bat is custom made and hand made to order. No exceptions ever. Our customers believe our prices represent the best consumer value for baseball bats. No Pre-Made Bats Waiting on Shelves to be Sold. We do not have any pre-made bats on shelves waiting to be sold as "custom made bats." Putting your name on a pre made bat is hardly what we consider, "Custom made to the specifications of our customers." A Genuine Canadian Yellow Birch bat with the Heartwood Barrel Upgrade. All of our clients, not just the pros, can order a heartwood barrel upgrade. This upgrade requires the skill of an experienced bat-maker and of course, premium wood quality. And in fact, these upgrades cannot be completed with consistent premium quality unless they are made by hand. No computer can replace the experienced eye of a skilled bat-maker. *Upon request we send our customer's photographs of their bats as they are made. Our customers have a critical role in the design and manufacturing of their bats. Our job is to make the exact bat our customers want...nothing less. Above, True Hickory bat with logo from the movie "The Natural." Our first priority is providing the best performing bats; customized logos and labels are included. We take our craft seriously and provide the highest quality bats in baseball. Custom Made Bats from the Wood YOU Provide! We have made bats from Red Mulberry, White Oak, Pearwood, Mountain Mahogany, and other species shipped to us by our clients. It is the best experience for those who demand truly custom made bats. Think about using your own custom made bats made from a home-grown tree! If you are not sure about the quality of the wood or the tree species, just drop us an email or give us a call. We will not make a bat from inferior wood UNLESS it is for tophy or display purposes. Above, a Pearwood log, shipped to us by our client...to be made into a very special custom-made baseball bat! Above: Our unique wood hardening process take two days to fully cure. The absolute BEST Quality Wood...We use only the top 3% of wood harvested for baseball bats. Every bat is made to order. We never sell pre-made bats. 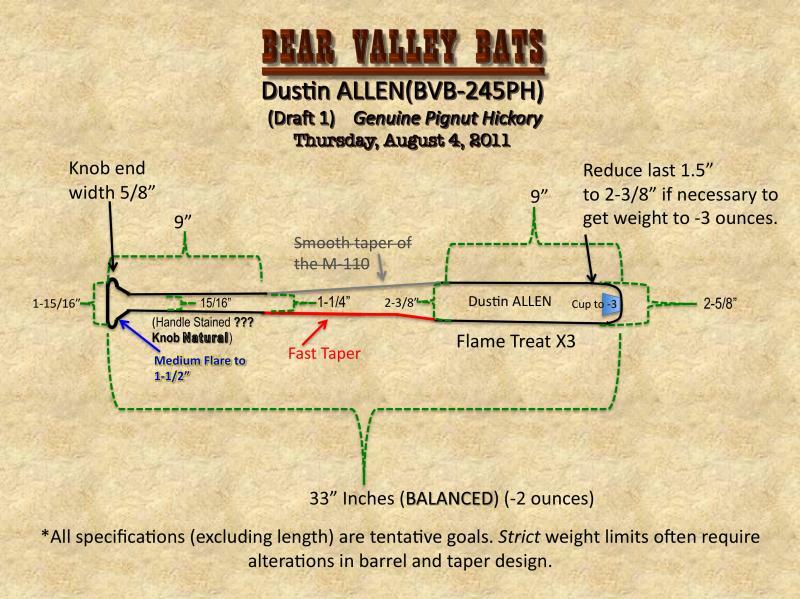 Every Bear Valley Bat is the same quality...THE BEST. All our bats are professional quality. 5.) And every bat has a hardened barrel, unique to Bear Valley Bats. Copyright 2010 Bear Valley Bats. All rights reserved.